A mother’s lesson to her son who became obsessed with branded clothing has gone viral throughout the world. According to the BBC a mother based in Georgia, US, taught her 13-year-old son quite a lesson when he started acting entitled. Cierra Brittany Forney (28) took to Facebook to share how her son had been acting up. Anthony was “acting like he's too good to shop at Walmart, or making snarky comments about kids at school who shop at the Goodwill [a second-hand shop]. I don't tolerate that,” she wrote. She told the BBC that she then decided to teach him a lesson. “It's the first time I've ever done anything like this,” she said. The mom then shared a photo of Anthony shopping at the second hand store with a budget of $20.00 (R230), buying clothes to wear for the week at school. “Today, he took his own $20.00 to the Goodwill to buy clothes to wear the entire week to school. Whatever he found is what he would have to wear. 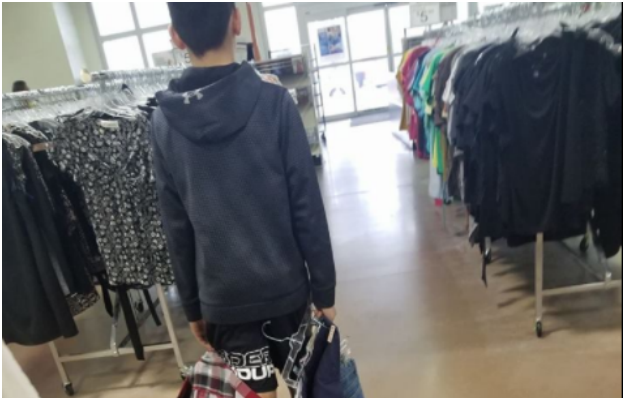 He isn't happy and shed a few tears but I firmly believe in 15 years he will look back and laugh at the day his mom made him shop at Goodwill. “I want to teach my kids that money isn't everything and if you have to degrade other people because of where they shop, then you too will shop there. Side note, I love the Goodwill! !” She captioned the post. Cierra explained to the BBC that her and her kids have “had multiple discussions about how having nice things is a privilege, not a right, and he can have it all taken away in a second”. And WLNS reports that the post struck a chord with hundreds of thousands of parents globally. Her Facebook post has been shared more 250 thousand times and liked by over 720,000 people, many applauding her actions. Some commenters shared their support and one posted, “As a mom whose son gets picked on because he doesn't wear expensive clothes (because of my health issues holding us back) I personally want to say THANK YOU for teaching your son a valuable lesson. What do you think of this mom's approach? How do you handle entitled behaviour at home? Send your comments to chatback@parent24.com and we may publish them. Please let us know if you'd like to stay anonymous.